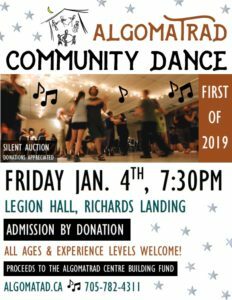 AlgomaTrad » AlgomaTrad First Dance 2019, Friday, January 4! AlgomaTrad First Dance 2019, Friday, January 4! DAAAAAAANCE! A fun community celebration. Callers include Julie Schryer and Donna Bisson. A variety pack of stellar musicians will be playing the tunes including members The O’Schraves. Time to DANCE into 2019 at AlgomaTrad’s annual First Dance of the Year. 7:30PM Introduction to Contra and Square Dancing for beginners and families. Bring your own water bottle or cup so we don’t have to do dishes! We like to eat squares while square dancing, so bring some along! Silent Auction Table – Donations of handmade or repurposed quality items, food, or services are appreciated.